These two flavors taste great together. "Why does this game exist?" I remember asking myself that when Mario + Rabbids: Kingdom Battle was first leaked and later announced. On paper, the idea of a crossover between the Super Mario franchise and Ubisoft's Rabbids seems like something that's not up my alley. And yet the first time I played it, I came away a convert. 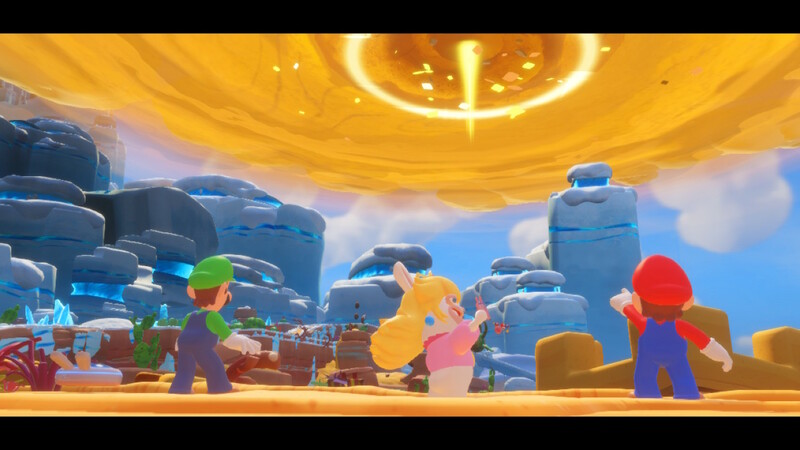 Mario + Rabbids was a good, fast, fun take on the XCOM style of strategy. My only remaining question was: would the rest of the game be just as fun as the small snippet I played at E3? I'm glad to say it is. 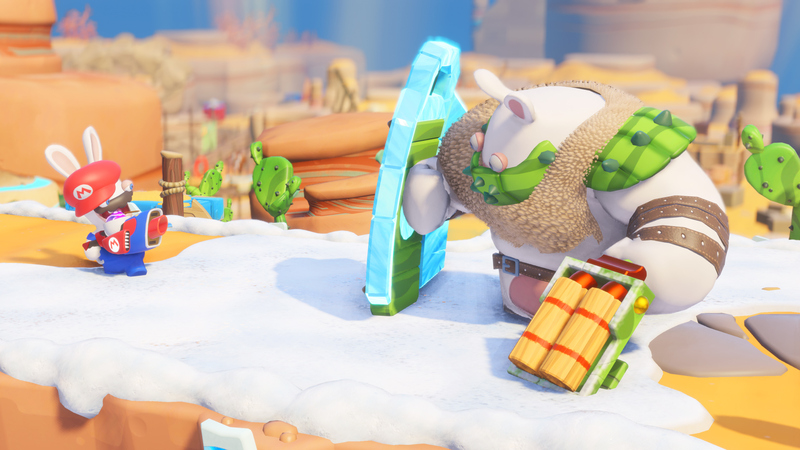 Mario + Rabbids: Kingdom Battle is a winner of a game and Ubisoft should be proud of what it has started here. The game's story begins when a young woman invents the SupaMerge, a helmet that can combine any two objects. The Rabbids stumble into her lab via their Time Washing Machine and one of them puts on the helmet. It uses the SupaMerge on the Time Washing Machine, sucking the entire crew and various objects from the lab into the Mushroom Kingdom. It's up to Mario, his crew of classic friends, and their Rabbid counterparts to catch Spawny, the Rabbid with the SupaMerge helmet, and restore order to the Mushroom Kingdom. It's a decent story, but the Rabbids don't contribute nearly as much as they could; they're fun, but they're more forces of nature than characters. 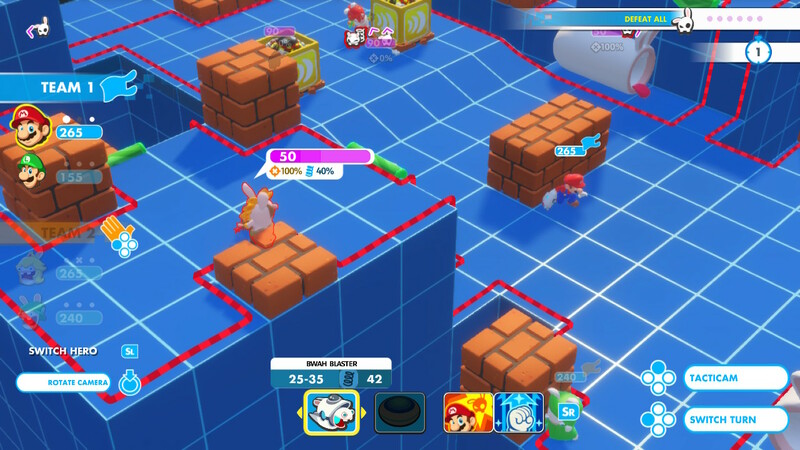 As I noted before, Mario + Rabbids is an XCOM-style strategy game. You have a small squad of three, who fight larger squads of various enemies in isometric levels. 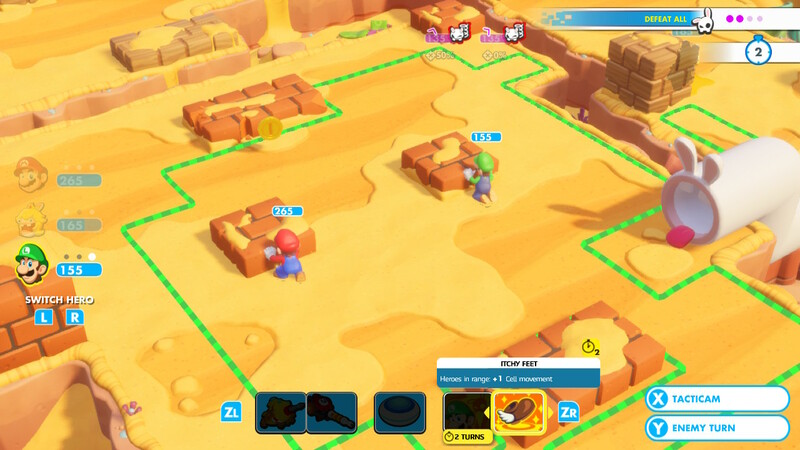 Mario + Rabbids is turn-based, so your squad moves as a whole and then the enemy squad moves. During your turns, each of your team members can move, attack, and use a secondary ability. (Sorry, unlike Disgaea, your movement can't be cancelled if you make a mistake.) With multiple moves per character, it's all about maximizing your move combos and squad interactions: bounce an enemy into the air with one attack, where Mario takes aim with his Hero Sight for a second mid-air attack. 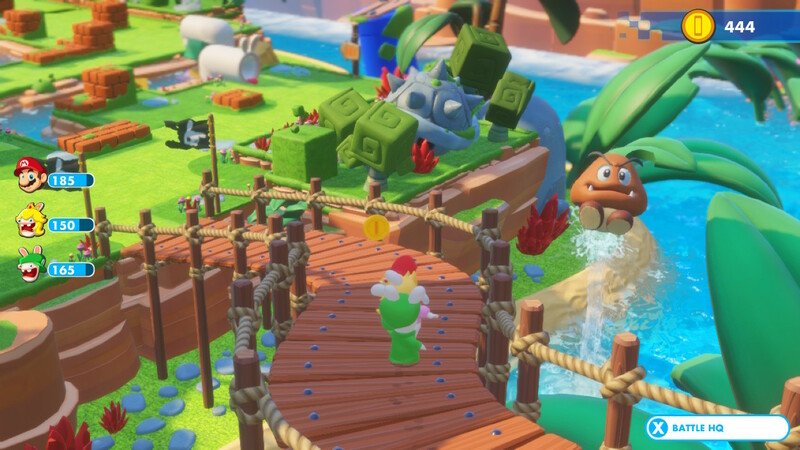 Where Mario + Rabbids excels is in cutting away a bit of the complexity from the strategy genre, while still retaining much of the depth. 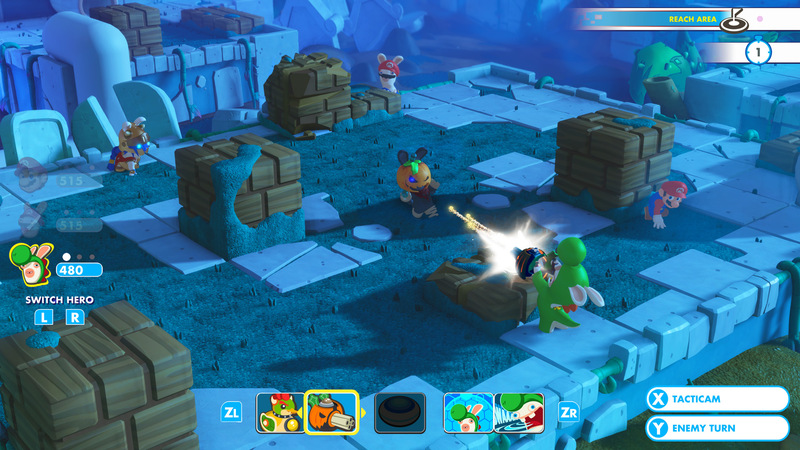 As an example, most of the gameplay is based around cover, with each of the combatants having a different chance to hit their target based on which type of cover they're behind. Tall cover lowers the hit chance to 0%, half-cover is 50%, and you have a 100% chance to hit anyone simply standing away from any cover. There's little of the futzing around that pops up in XCOM, where you'll end up missing a shot on any enemy despite having a high chance to hit. You either hit, you don't, or you flip a coin. You also do more damage from higher ground. It's a welcome streamlining of classic strategy mechanics. 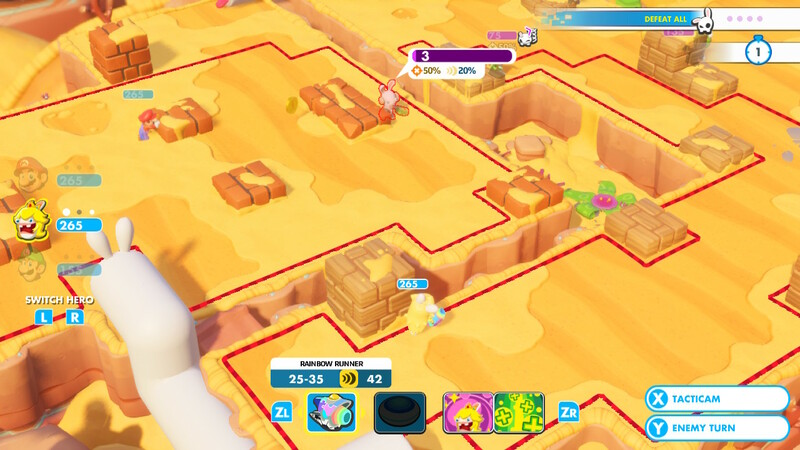 Mario + Rabbids adds a general sense of speed to the battles through two additional mechanics. The first is Dash, where your characters or opponents will deal a bit of damage if their movement path intersects with an enemy's position. Then there's Team Jump, where moving onto one of your own team members allows them to boost you to another spot on the battlefield. Together, they make battles in Mario + Rabbids more movement heavy. Yes, you'll spend a lot of time behind cover, but there's a stronger focus on moving between cover, or using Team Jump to reach a more advantageous position. Ubisoft also throws in some alternate objectives and weirder ideas. There are levels where you simply have to reach an area, making your way through a lengthy battlefield to touchdown on a specific spot. Or there are Chain Chomps, neutral figures that bite down on the nearest person; they force you to move around to keep an enemy between you and the Chain Chomp at all times. In one region, there are Boos that will grab your characters and teleport them to a different spot on the battlefield. Each of the Bosses also offer their own unique mechanics, leading to some interesting fights. Not to keep comparing Mario + Rabbids to XCOM, but I actually look forward to the former's boss fights, as opposed to the Kings of XCOM 2, which can frequently end up as frustrating wars of attrition. All told, Mario + Rabbids is a bit more dynamic than some other strategy fare. 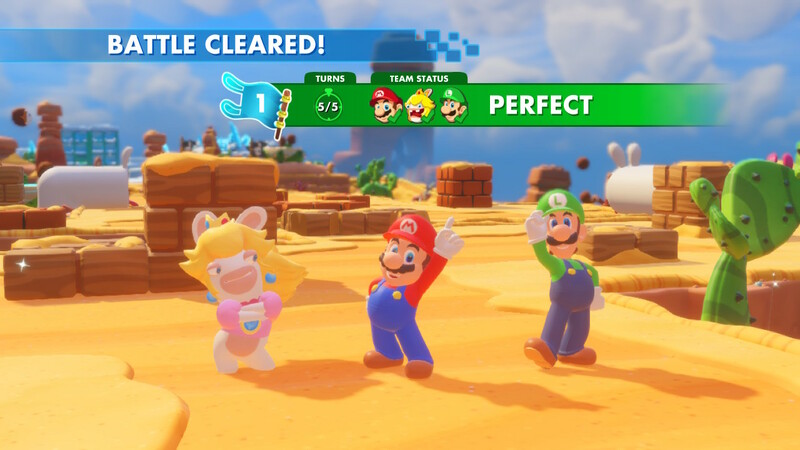 Mario + Rabbids is also a bit lighter than some other strategy games, but it's by no means easy. In fact, once you get deeper into the game, it starts throwing enemies with more abilities at you and putting them together in some tough combinations. It's not punishing - there's no permadeath and reviving a character isn't hard - but you will lose some fights. For those who aren't up to the challenge, every time you enter a fight there's an Easy Mode prompt, letting you lower the difficulty at the press of a button. You build your team from a total of eight characters: Mario, Luigi, Princess Peach, Yoshi, and the Rabbids versions of those four. You start the game with Mario, Rabbid Luigi, and Rabbid Peach, and slowly unlock the other team members over the course of the game. Each character has their own focus: Mario is an all-rounder, Luigi is your long-range sniper, Rabbid Peach is your early support healer and defensive dynamo, Yoshi is a glass cannon dealing heavy damage from afar, and Princess Peach is a highly-mobile fighter who brings a little offense and defense. You'll lean towards specific characters depending on your playstyle, but there's more options to tailor them to your needs. 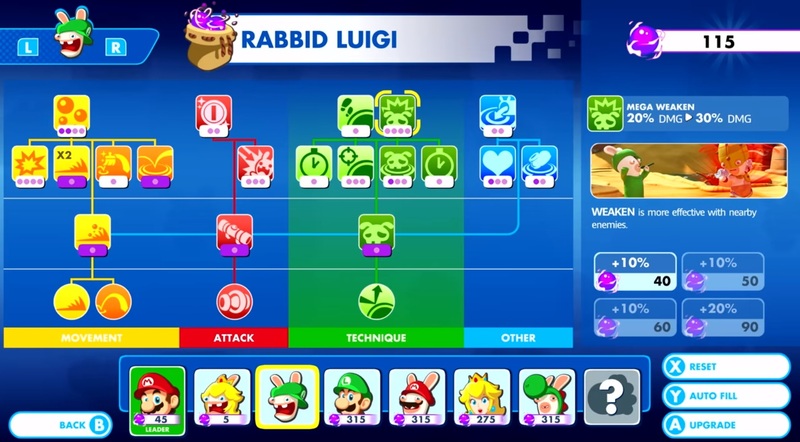 One issue that pops up here are the restrictions: Mario always has to be in your party, and one of the other characters needs to be a Rabbid. It hampers your potential squad, and hamstrings you when you only have three slots to work with. First up, there are the weapons. 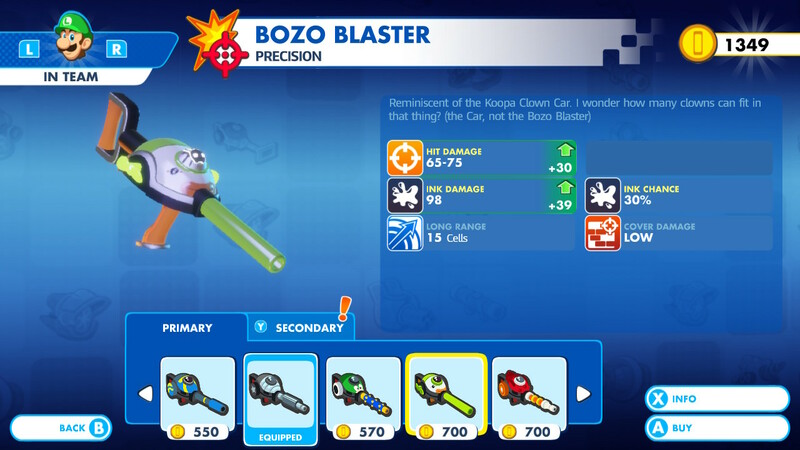 Each character has a primary weapon: Mario and Rabbid Peach use the basic Blaster, Peach and Rabbid Mario use the shotgun-like Boomshot, Yoshi and his Rabbid counterpart have the gatling gun-style Rumblebang, Luigi is the sole user of the Precision weapon, and Rabbid Luigi uses the Yoyo-like Bworb. They also have secondary weapons you can unlock via Skill Trees. You'll acquire new weapons by completing missions, defeating bosses, or simply exploring the world. Once you've unlocked the weapons, you can purchase them using coins, which are found in the world, dropped from destroyed cover or special hits, or rewarded for completing missions well. The unlock system means you'll sometimes receive weapons after they would normally be useful, which is a bit odd, but generally, it's a linear progression. Every character has their own unique weapons and each weapon has different stats. There's the basic progression in damage, but some weapons have shorter or longer ranges, do more damage to cover, or have an enhanced chance to apply a special effect to certain types of foes. The special effects all have their uses: Bounce shoots enemies high in the air, Push is a knockback, Stone stops an enemy dead in their tracks, Ink prevents them from using weapons, and so on. Each character's weapons lean in a specific direction; Luigi has primarily Bounce and Ink weapons for example. Progression is also gated by the Skill Trees. Each character has a limited Skill Tree, with options in Movement, Attack, Technique, and Other. You'll gain Power Orbs by fighting mid-bosses and bosses, and then spend these Orbs on different options in your trees. What I enjoy is that you're not locked into any particular direction: You can reset all your choices at any time and start anew. Maybe your Mario was a highly mobile fighter, stomping on the heads of enemies. You can switch that up, making him more melee-focused with the ability to boost the rest of his team. As you complete worlds, Mario + Rabbids also gives you an overall boost to your heroes. The worlds themselves are all pretty amazing; bright and colorful mixes of different ideas. There's the forest and jungle-themed Ancient Gardens; Sherbet Desert, where the desert meets ice and snow; the haunted Spooky Trails, and finally the very Bowser-esque Lava Pits. Like the older Mario games, each world is separated into various sections (World 3-2, World 3-3, etc.). The worlds are playgrounds of exploration for Mario and his squad. 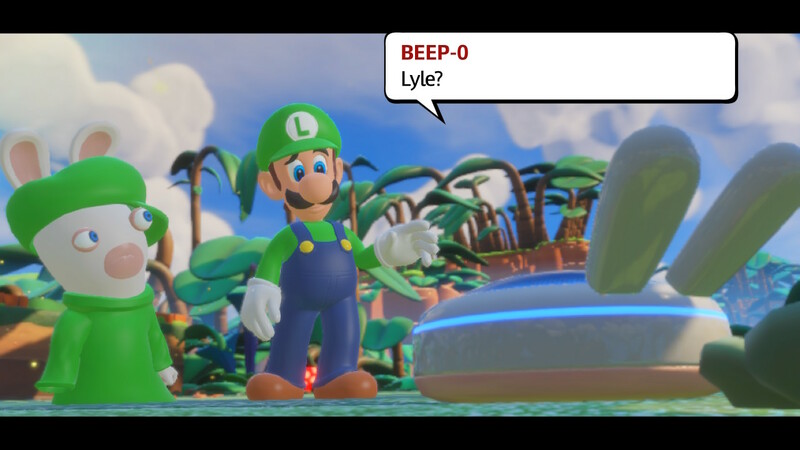 Your team will follow Beep-0, the in-game manifestation of your movement cursor, across the Mushroom Kingdom. You'll solve puzzles, find coins, and discover hidden secrets. There's Mario staples, like Red Coins and Blue Coins you have to collect within time limits, or warp pipes to get from place to place. Certain areas of these worlds are general movement, while others are combat sections, denoted by entry flags. 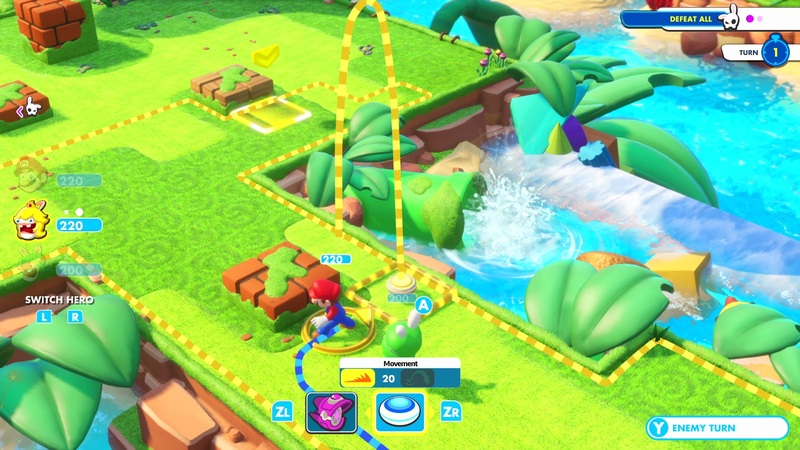 Mario + Rabbids has a significant amount of backtracking. Sure, you'll find secrets and treasure chests on your first time through certain worlds, but you'll also see areas you can only access once you've unlocked certain environmental abilities. These moves are for Beep-0 and are unlocked at specific points in the game, allowing you to push heavy blocks, dig down, and more. These encourage you to return to earlier sections of the game to open up new areas and find new treasure. 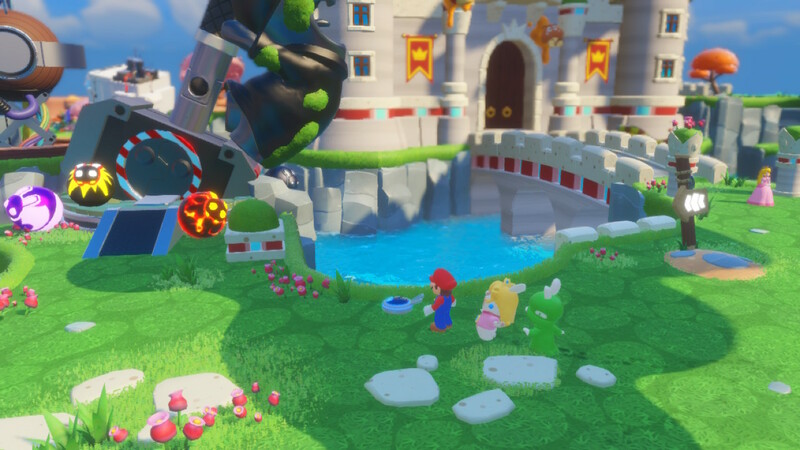 Mario + Rabbids just ends up being a delight from top to bottom. This is a gorgeous game – honestly, my portable mode screenshots don't do it justice – running at 720p in portable mode (900p in docked), roughly at 30 fps. There are frame rate dips here and there, usually in cinematic attack cams. But these worlds are full of life, detail, and color. Whether it's a lush jungle with Donkey Kong barrels in the background, a haunted region with Boo lamppost, or Princess Peach's Castle, Ubisoft's artists spent a great deal of time adding little flourishes that recall Nintendo's history. Most of the time, Mario + Rabbids is just a goddamn joy to look at. It's also a solid listen. I was jamming along to the soundtrack during the game, something that's honestly rare for me. (Nadia is USgamer's music fiend.) A quick Google led me to the fact that GoldenEye 007, Banjo-Kazooie, and Perfect Dark composer Grant Kirkhope was behind the soundtrack. It's a jaunty little soundtrack that fits right in, with faint allusions Nintendo classic tunes. And there's still more though! Once you finish the lengthy story campaign, there's more available for you to dive into. You can revisit each fight to get a Perfect rating and Gold trophy (finish under a certain number of turns with all of your characters alive). 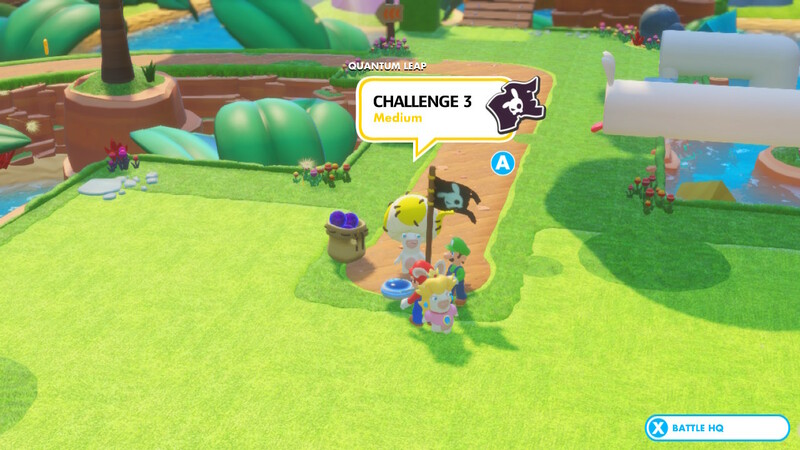 You can take part in specific challenge levels or hidden stages in each world. There's a local multiplayer cooperative mode, where each player takes a Joy-Con and chooses two team members to tackle a stage together. The only thing that's missing here is online multiplayer and some sort of option to randomly-generate levels. Mario + Rabbids is not a concept that I expected to get this much love. This is a legitimately great strategy experience, tailored toward the sensibilities of Nintendo and the capabilities of the Nintendo Switch. 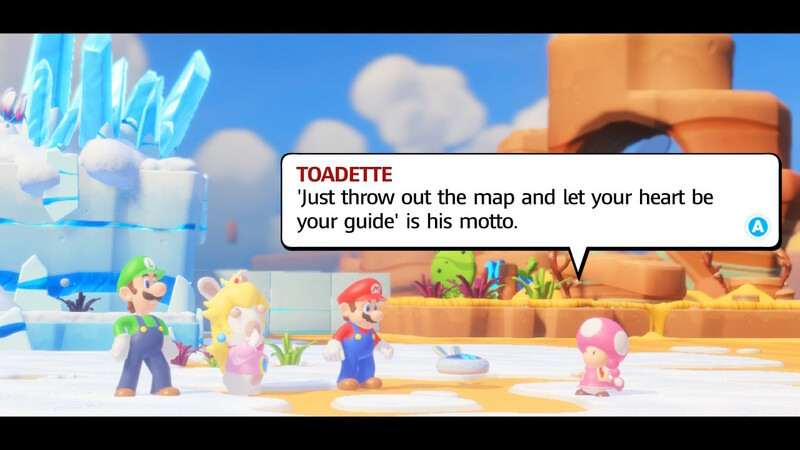 It's a charming adventure for Mario, and the Rabbids don't get in the way, even if they don't necessarily add much either. 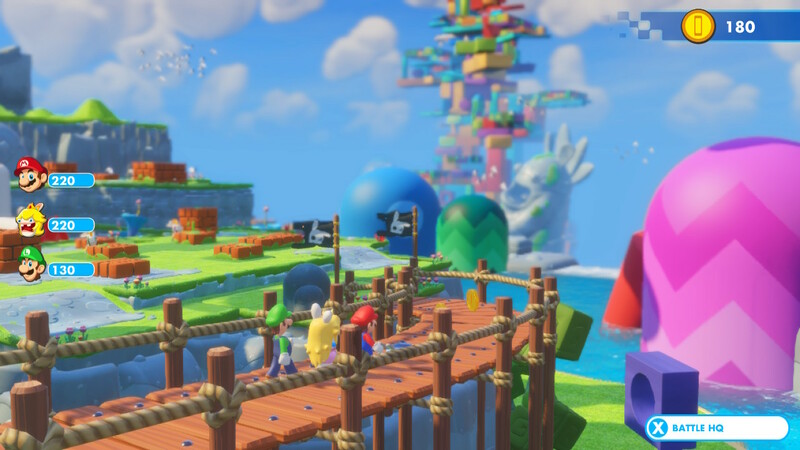 In the same way that the original Super Mario RPG showed Square Enix using Nintendo's property to create some magic, Mario + Rabbids delivers something close from Ubisoft. If you're up for the challenge, pick up Mario + Rabbids: Kingdom Battle. It's worth it and I'm glad it exists.